At least once a day, something happens around here that makes me kind of cringe. Markers, crayons, water, paint, sand and on and on. Something happens. And this is normal, I tell myself. I remember my mom sweeping the kitchen floor as the five of us would track pounds of dirt and grass through the house. We’d even run through the little mounds of dirt she’d neatly organized with no regard for the effort or the frustration of just having cleaned up for the tenth time that day. This entry was posted on Friday, April 16th, 2010 at 11:24 pm. It is filed under family and tagged with children, labarge, photojournalist, portland, tim. You can follow any responses to this entry through the RSS 2.0 feed. 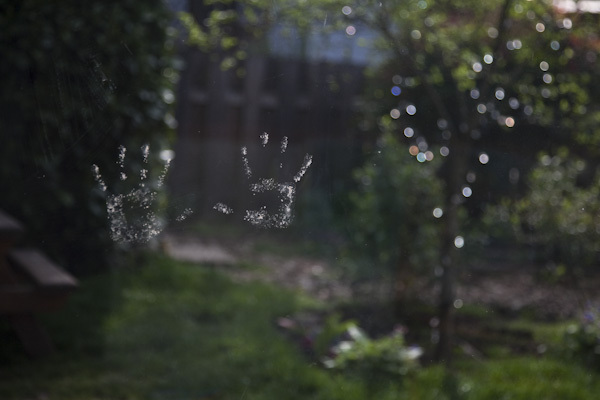 I love this picture of the two hands on the window. Amazing!